The partner of a chronic snorer loses over an hour of sleep every night . Good sleep can be hard to come by for all parties in a bedroom polluted with snoring, particularly if snoring transitions to sleep apnea. Sleep can seem like a real waste of one third of your life; time spent doing apparently nothing when there’s so much else you could be doing. A lack of sleep however, spells a shortened life and one where your waking hours are severely blunted. By staying awake and spurning sleep, more time is lost than is gained. We must accept that sleep is vital for health and survival. Sleep seems to be a pretty inactive period. On the surface, our sincere lack of movement or responsiveness would indicate that our body is dormant. This isn’t so. It’s very active, just in a different way. During sleep, our bodies and brains are busily repairing, refreshing and rewiring. Good sleep can even make you look better. Cortisol – a stress hormone – increases when we lose sleep and in turn decreases the production of collagen, a protein that gives your skin smoothness. A study in Sweden asked volunteers to rate the attractiveness of people who had 8 hours sleep against those who had experienced 31 hours sleep deprivation. The sleep deprived people were perceived as less healthy and less attractive . The inverse of the advantages of good sleep is the damage that can be done with sleep deprivation. Indeed, multiple studies have shown that getting less than six hours of sleep per night significantly increases the likelihood of an early death . In the short-term, the mental impairment from moderate sleep deprivation equates to the effects mild alcohol intoxication . Extreme sleep deprivation has even been shown to cause hallucinations. Poor sleep is the underdog of public health. Problems like obesity, cancer and dementia are far more prominent in the public consciousness than problematic sleep is. If you consider that bad sleep has a hand in all of these conditions, you’ll appreciate the importance of getting a good night . 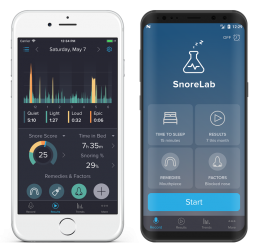 If snoring is having an impact upon the sleep quality of you or your partner, these nighttime noises definitely need addressing.